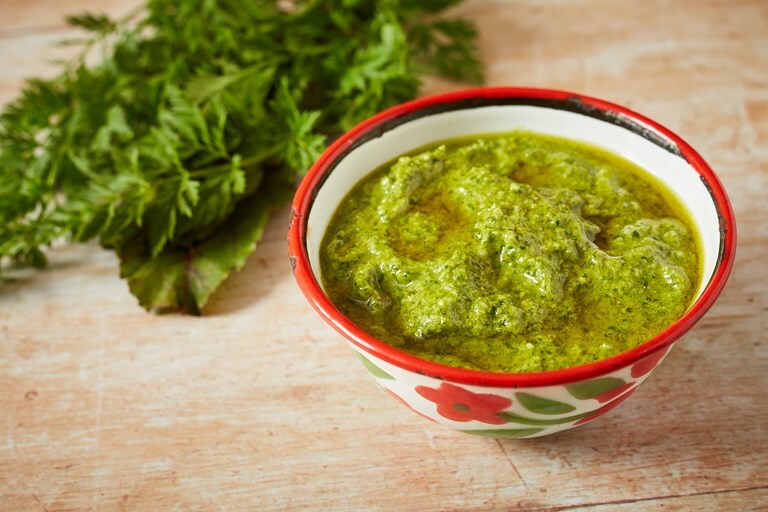 If you often find yourself binning the beautiful leaves and tops from your vegetables, this veg top pesto recipe is for you. Beetroot leaves, carrot tops and radish leaves all make a superb base for this fragrant, adaptable pesto, and throwing in a few herbs that may be lingering in the fridge will only be a welcome addition. Read Victoria's feature for further tips on using up veg tops and leaves. Struggling to find a use for peppery radish greens once you’ve finished dunking the jewel-bright vegetables into fancy butters or dips? Or how about that long swishy green tail of fronds on the end of market-bought carrots, or turnips, or beetroot tops, or celery leaves, or… well, you get the picture. This fit-all pesto is a fantastic way to get the best out of your veg tops.